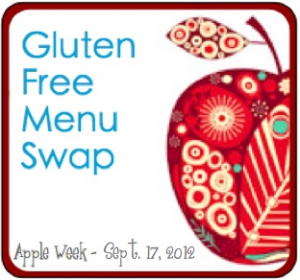 I am hosting the Gluten Free Menu Swap this week. Woo-hoo! I picked ‘apples’ as the theme. Some apple recipes I cook up are Apple & Cinnamonand Apple Cider Muffins, Chicken with Cauliflower and Apples, Spiced Apple Pancakes, mini Apple Sausage Quiches, Chicken Apple Bacon Sliders, Juicy Apple Turkey Burgers, Apple Slaw. Updated ABC Salad, Freezer Apple Pie, Apple Barbeque Sauce, Slow Cooker Baked Apples and Homemade Fruit Rollups. How do you use apples? 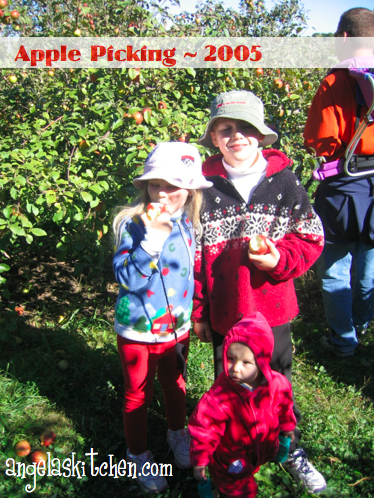 Our family’s big fall tradition is to go to an apple orchard and pick apples. Fortunately we live is an area with plenty of apple love! We always cart home plenty of apples (and fresh cider – can’t forget that!) for caramel apples, apple pies for the freezer, apple sauce, dried apples and cardamon apple butter. This year I think I’ll add an apple conserve with pecans and maybe some hand pies to the mix. Yum! Menu highlight from last week: Last week’s highlight isn’t something even on my menu, however the Coffee Cakes in a Mug(or in a jar at my house) I posted last week at Angela’s Kitchen have been so fun to experiment with. We just can’t seem to stop coming up with different versions. UseBetter Batter Flour as the flour mix and you’ll have a little treat for yourself in no time. Let me know what flavor combinations you come up with! The week’s breakfast options: Chewy Chocolate Chip Granola Bars or Pumpkin Waffles, fried or scrambled eggs (I like a bit of sautéed kale and garlic in mine), and various fruits. The week’s lunch options: Nut or seed butter sandwiches (on Carrot and Zucchini Bread or gluten free Honey Oat Millet Bread), Chicken & Veggie Nuggets, Corn Dog Muffins, hummus, various fruit, and veggie sticks. For the freezer: Make a double batch of Moroccan Chicken Tagine with Apricot Quinoa Pilaf for another day. Right before serving dinner, set aside the amount you will freeze to chill in the refrigerator. After dinner, package the cooled quinoa and chicken into separate freezer bag(s) or freezer safe containers, seal, label and freeze. For the freezer: Make a double batch of Chicken Thai Pizza, two for dinner and two for another day. Having pizza in the freezer makes it easy to have pizza night when ever you want it! On a foil or parchment lined piece of cardboard, smooth out your dough and top it. Immediately pop pizzas into the coldest part of the freezer. After dinner, wrap each pizza well (it should be quite firm by then), label and freeze. Kimberlee at The Peaceful Mom joins us this week with a menu plan that includes breakfast, lunches and dinner. Woo-hoo! For dinner she is serving BBQ Chicken Tostadas with Tomato Cucumber Salad (YUM! ), Beef Chuck Roast, Chicken and Veggie Stir Fry, Country Style Ribs, Spicy Chicken Thighs, Crockpot Chili, and Steak & Peppers. Sounds delicious! I can’t wait to check out the links to her Veggie Scramble and Crockpot Granola. Lisa at Extraordinary Life found a couple of delicious sounding paleo apple recipes to share: Apple Spiced Coffee Cake (tasty!) and Paleo Granny Smith Apple Crisp. She must know I am powerless in the presence of cinnamon coated apples, so I will have to bake up some of that coffee cake to indulge in without the bulging. 🙂 Thank you, Lisa! This week she is serving up Fried Pork chops with broccoli and Stouffers Harvest Apple Copycat Recipe (made over to be paleo, of course), BBQ Sauce & Crock Pot Pulled Pork, Grilled Steak with Butternut Puree and Sauteed Spinach, and Spaghetti Squash with Bolognese Meat Sauce. It is her birthday week, so she will be making these yummy looking My Favorite Cheesecakes for her birthday treat. Happy Birthday, Lisa! I ditto what Heather said. I am most definitely going to have to bake some apples in my slow cooker now. Never though to do that before!